I’ve mentioned before on Noah’s blog, in the middle of a debate about Sarah Palin (thank goodness we don’t have to think about her anymore, at least for a while!) that I’d had experience with the past years’ US science budget cuts affecting my family. Well, here’s where that came from: my husband is currently deployed with the US Antarctic Program (USAP) in McMurdo for the 2008/09 field season in a role supporting researchers in the field – in sea ice camps, the McMurdo dry valleys, and other places – and making sure they have transportation. Thing is, the budget cuts affecting the USAP in recent years are actually so severe that the senior management at the NSF Office of Polar Programs has felt compelled to publish a letter to the Principal Investigators funded to do research in the Antarctic on their website. This season, the staffing shortages are so great that – there’s no nice way to say this – my husband sounds absolutely exhausted and dispirited with the situation of having to work incredibly long hours, without hopes of actually catching up at some point. In USAP slang: he’s utterly toast. It’s early November.. the Antarctic field season is not over until the end of February. The USAP support staff consists of a – still – large number of extremely dedicated and skilled people with many years of experience between them. Although recent years have seen a large number of long-time USAP folks quitting, because they were burned out or frustrated or both (some of them, trying to come to grips with the experience, have written books and maintained an… interesting website for years), there are still many others that keep things together and running as well as possible. The first time Randy deployed to the Antarctic was in 1992. 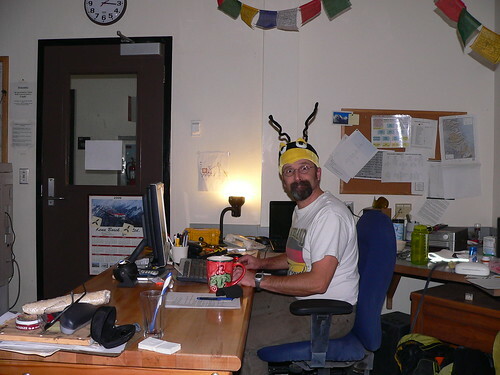 Adding up the time ‘on the ice’ since then, he has spent years supporting the USAP in various roles, at Palmer and McMurdo stations and on the two USAP research vessels. Although it’s been hard, he has always enjoyed the fascinating and gorgeous environment and the people he has worked with (well.. mostly). This season, he is coming home in early December. And, I think, that’s probably good. This post was first published on Nature Network, which has since been discontinued. The post has been moved to SciLogs, where you can also read the comments made at the time. That’s such a sad post, Steffi. Bitter-sweet. And love the picture. Oops, it was meant to be funny – but I guess it is also sad. The US has the biggest Antarctic research program and also supports those of many other nations using McMurdo as a jump-off (e.g. New Zealand, Italian bases and many international collaborations). The budget cuts will take a long time to recover from! Don’t get me wrong, it is a fantastic post (submit it to the blogging anthology book!). It is because you are “not moaning” that it is all the more effective and poignant. Heh – that’s another piece of Antarctic slang: ‘stop whining’!